Configuration from Lab 123 must be used in this lab. After merging the three ASes (Lab 123/124), the administrator of AS 50 noticed that prefixes arriving on R5 carry the AS 123 in the AS_PATH attribute. Before AS 50 configure their R5 router to peer with AS 123, the administrator asked you to remove AS 123 from the AS_PATH attribute. Pic. 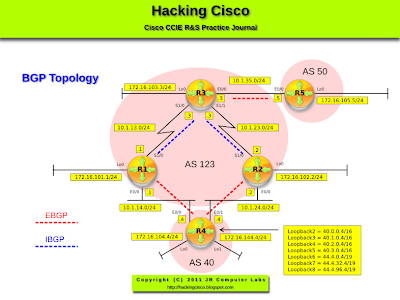 2 - Current BGP Table on R5. Pic. 3 - R5's BGP Table. The option 'no-prepend' removes the local-as numbers (look at lab 124). The option 'replace-as' strips off the original AS number when updates are sent to the BGP neighbor configured to use the local-as number.